Dr Phuthuma Seoka achieved a degree of fame during the 1980s as a result of the landmark exhibition Tributaries, curated by Ricky Burnett in 1985, as did Jackson Hlungwani (qv. ), Nelson Mukhuba (qv.) and Noria Mabasa (qv.). Like the others, Seoka was not trained formally as a sculptor. He left school when he was 16 years old and by 1953 had established a business in Johannesburg, Seoka Twin Products, which sold patented herbalist medicines and remedies. It is this business link that provided the title ‘Dr’, which Seoka chose to retain even after he was no longer in the trade. In 1966 he returned to Molototsi, located in Limpopo between Duiwleskloof and Giyani and opened a barber shop beside the main road. On the recommendation of a traditional healer he started to carve as a means of dealing emotionally with a recurring dream of a large mountain snake. He initially used horn and later stone and wood. Throughout his career he continued to carve utility items for his community, such as walking sticks, spoons and bowls. Originally he made carved objects for local tourists and only after he was ‘discovered’, for the urban art market. His body of work consists primarily of single figures, most of them male and animal, ranging from city slickers to wild animals, from the famous to skeletons. He used two techniques: the first is more conventional, where the image is carved from a single piece of wood, while the second is more like an assemblage. Long narrow pieces of wood with two branches at one end were trimmed and placed in such a way as to form the torso (sometimes with a head) and legs. To this core Seoka nailed branches for arms, feet, hands, heads and other appendages such as snakes or crocodiles. Bright enamel paint was added to finish the work in panoplies of rich patterns and designs, making for fantastic and funky sculptures. Seoka had a keen sense of humour and this is often evident in his work. Titles were added later to suit what had emerged – except perhaps for the portrait of P.W. Botha (plate 257) in the Campbell Smith Collection. These were more consciously conceived and deliberately carved. In some early works he would occasionally add other materials; for example the mane of the lion (plate 261) is made from rope attached to the head. 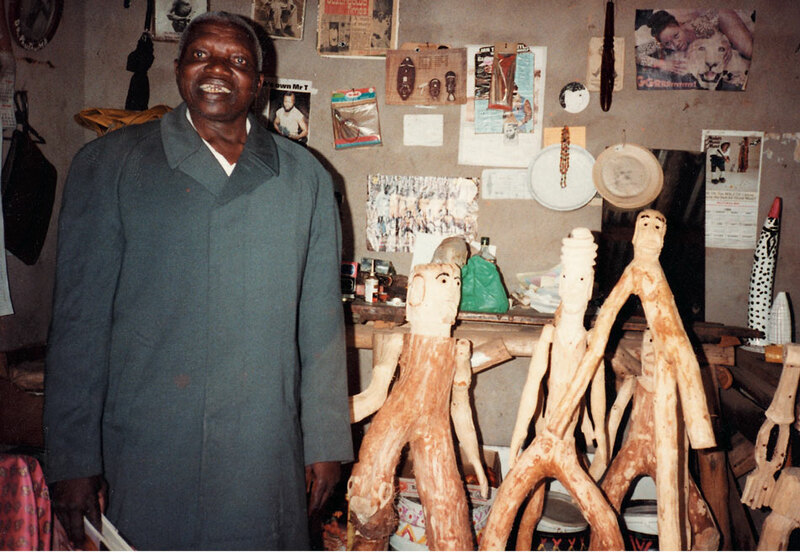 Seoka’s homestead was enhanced and individualised – partly as an advertising strategy and partly because of whom he was; he also carved faces in living trees and created a sculpture garden literally sprouting painted figures among the vegetation. In the early 1990s there was such demand for Seoka’s work that he taught his sons to make similar pieces, hoping to set up a community workshop. This project failed because the art community in the city considered that his work had become repetitive. Nobody had told him that the art market valued originality and the work of a particular individual. This raises not only the differences between the urban and rural situations in the lack of education, information and exposure on the one hand, but also the economic power and control over creativity on the other. Born 1922, Modjadji, near Duiwelskloof, Limpopo Province; died 1997. Selected Exhibitions 1985: Tributaries, Africana Museum in Progress, Johannesburg and Munich, Germany. 1986: South African Arts Association, Western Cape; Standard Bank Foundation Collection of African Art, University of the Witwatersrand, Johannesburg. 1987: Goodman Gallery, Johannesburg; Basle Art Fair with Goodman Gallery, Johannesburg; VhaVenda, Standard Bank National Festival of the Arts, Grahamstown. 1988: Vita Art Now, Johannesburg Art Gallery; The Neglected Tradition, Johannesburg Art Gallery. 1989: Images in Wood, Johannesburg Art Gallery; Ten Years of Collecting, University of the Witwatersrand, Johannesburg. 2001–2003: Motho ke motho ka batho (A person is a person because of other people). Organised by the University of the Witwatersrand for the Department of Arts and Culture. Exhibited in Polokwane, Limpopo Province, June 2001 to March 2002 and African Window, Pretoria, September 2002 to November 2003. Collections Durban Art Gallery; Johannesburg Art Gallery; Tatham Art Gallery, Pietermaritzburg; University of the Witwatersrand, Johannesburg; Iziko SA National Gallery, Cape Town. Dr Phutuma Seoka photographed by Bruce Campbell Smith in his studio c. 1987. Courtesy of Bruce Campbell Smith.